A jogger runs along the Burke-Gilman Trail in Lake Forest Park while CEE researchers install a new sensor system they are testing with the goal of keeping pedestrians and bicyclists safe. Crossing the street may not seem like a dangerous activity. However, almost every 90 minutes a pedestrian is killed and every eight minutes a pedestrian is injured in the United States, according to the National Highway Traffic Safety Administration. The problem is steadily worsening, according to statistics. Four years ago, a pedestrian was killed every two hours. Three years ago, a pedestrian was killed every one hour and 36 minutes. Now, the most recent data from 2016 reveals the average is six minutes shorter. To date, little has been done to address safety issues from the viewpoint of pedestrians and other non-motorized users, such as bicyclists. Historically, the majority of research has focused on safety issues from one perspective, that of the motorist. To help keep pedestrians safe, a team of STAR Lab researchers is building a new type of communications system that connects various roadway users and sends safety warnings to both pedestrians and drivers, alerting them of potential conflicts in their oncoming path. The system can be used at conflict-prone locations, such as busy intersections. Led by professor Yinhai Wang, the research team includes postdoctoral researcher Ziqiang Zeng, Ph.D. student Yifan Zhuang and Ph.D. student Ziyuan Pu. Called the Smart Road Sticker (SRS), the technology consists of a small, solar-energy powered device that acts as a hub to facilitate communication between roadway users. Installed on light poles or other infrastructure near the roadway, the basic function of the SRS is to detect wireless signals of mobile devices that have the STAR Detection App installed as well as communicate with vehicles through onboard wireless communication devices. The app enables people to receive safety notifications, warning them of hazards such as a driver who has failed to stop at an intersection. “The system will let drivers know if they should stop or if it’s safe to go ahead,” Zeng said. The system greatly increases the number of connected roadway users. While newer automobile models are increasingly equipped with onboard wireless communication devices specifically for automotive use, these systems do not facilitate communication with pedestrians and bicyclists. Onboard units, which are required to communicate with the SRS device, can be added to older vehicle models. The alerts can be relayed to drivers either via the app on their smart phone or through the in-vehicle navigation system. 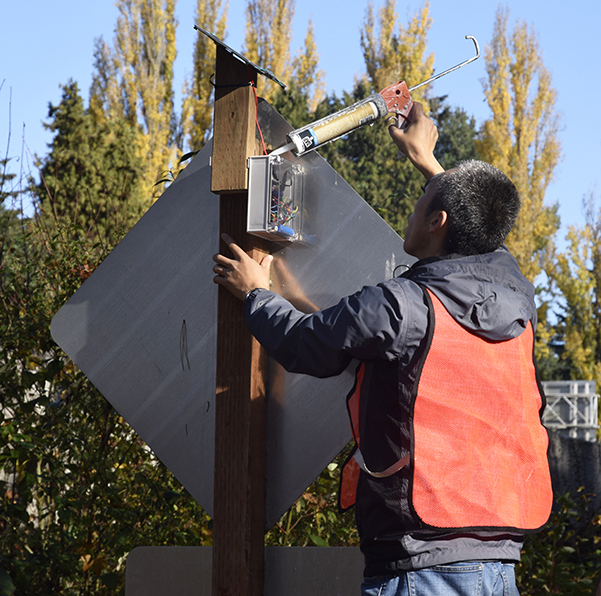 Visiting researcher Honggang Li installs a Smart Road Sticker on a traffic sign on the Burke-Gilman Trail in Lake Forest Park. 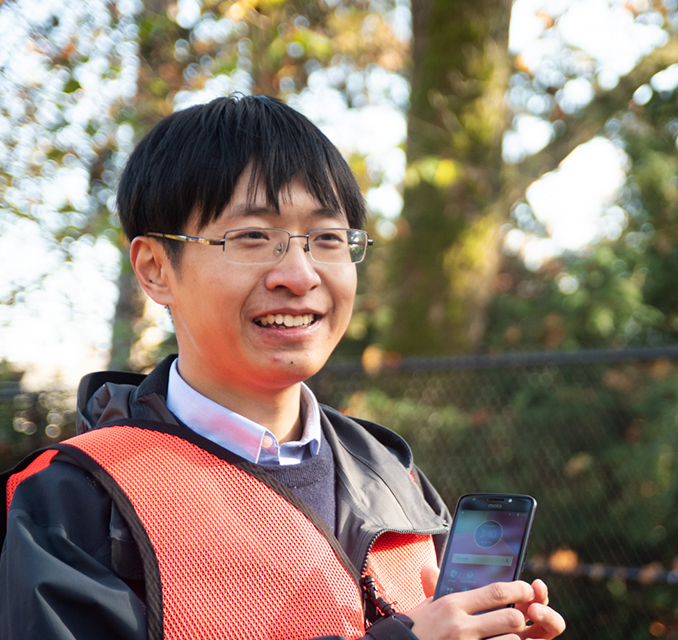 CEE Ph.D. student Yifan Zhuang explains how the STAR Detection App enables both non-motorized roadway users and drivers to receive safety notifications on their smart phones. To identify unsafe conditions and determine appropriate safety responses, a crash prediction algorithm was developed. The algorithm calculates if there will be a conflict between non-motorized roadway users and vehicles using information gathered from onboard units in vehicles, such as location, speed and direction of travel. The algorithm identifies the location of pedestrians and other non-motorized roadway users through the app. Sensors embedded in the SRS device also gather information from nearby infrastructure, such as when traffic lights turn red and green. The system is prepared to respond to various scenarios, one of which is when a pedestrian crosses the road and a driver violates the critical safety distance. Warning messages would be sent to both the driver and the pedestrian. The driver would be asked to brake and yield to the pedestrian, while the pedestrian would be urged to take proper actions in case the driver does not respond to the warnings. In another scenario, if a pedestrian is walking on a sidewalk with an upcoming hazardous situation, a warning message would be sent to the pedestrian asking them to stop walking until the situation is resolved. 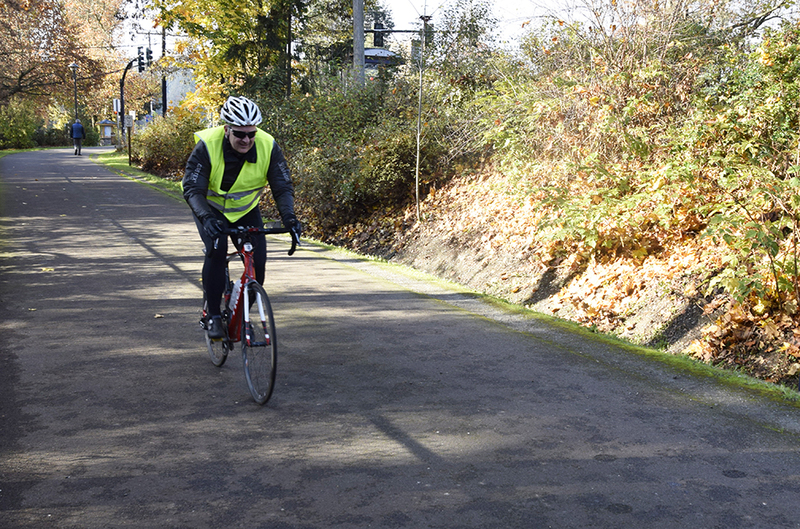 To test the system, the researchers installed three SRS devices on the Burke-Gilman Trail in Lake Forest Park in November 2018. The location was selected because the trail, which is heavily used by both pedestrians and bicyclists, is intersected by roads and driveways. The researchers also previously tested the system using traffic flow simulation software, to evaluate the system under various traffic and landscape conditions. The results indicate that the number of conflicts decreases when the number of connected devices increases. “The next step is evaluating the technology based on the performance and improving it to make it smaller and more accurate,” Zhuang said. A bicyclist rides along the Burke-Gilman Trail in Lake Forest Park, where researchers are testing a new sensor system to keep pedestrians and bicyclists safe.